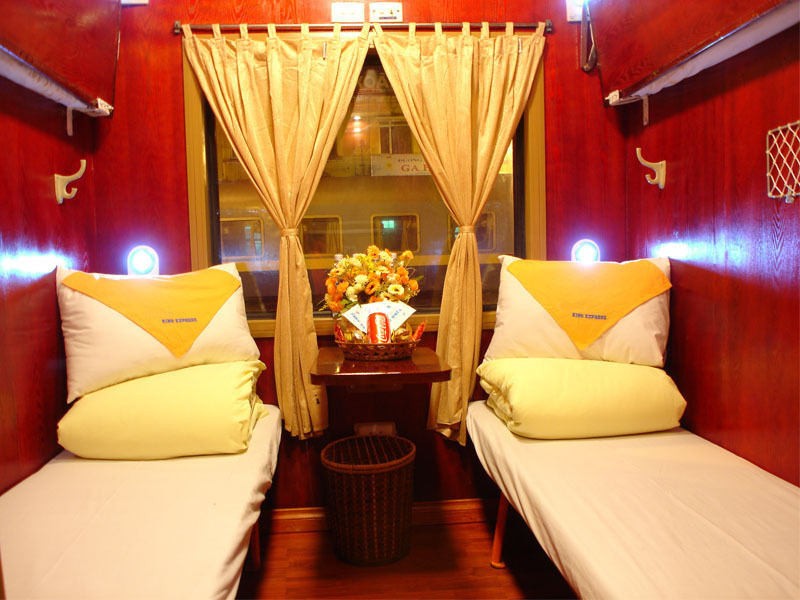 King Express Train will make your stay in these carriages memorable. Passengers are to hold the best opportunity to relax or simply let the beauty gliding over your spacious windows. Luxury, inspiration and refreshment are main characters of these carriages. All berths are wooden-paneled, air-conditioned with individual reading lamps, baggage storage. The passengers are served with a very tasteful drink in the morning upon the arrival to Lao Cai or Hanoi. King Express deluxe cabins offer a cozy atmosphere, relaxing to read or enjoy an intimate conversation. A Private Deluxe cabin creates an intimate space for couples with 2 berths only. These cabins are lovingly designed to for those who desire to have the privacy with remarkable interior decor. King Business class carriages embark visitors will indulge in the pleasure of the warm decoration and safety. These carriages feature a large space to fit your luggage, a large corridor and hot water suppliers on two sides of the carriages. Locks are carefully made to be sure you never lose things when beholding the panoramic views of ever-changing scenery. Each carriage can accommodate 28 passengers with the special care of staff. Each cabin has 4 soft berths; All cabins are air-conditioned, equipped with safe lock and bright, large corridors. Facilities are modern and well-fitted to bring you a good night on the train. - Ticket price does not include meals on the train.